For as long as we can remember, Above & Beyond has been satiating fans with dreamy trance and progressive house blends accompanied by emotional vocals, and this year is no different. With the release of “Common Ground” in January came a resurgence of love for this talented trio, and what better way to celebrate their ongoing reign than a musical showcase by the legends themselves at the RC Cola Plant put on by Florida-based Diskolab during the 2018 Miami Music Week. DiskoLab is known for their incredible production and we can’t see what they come up with this year. 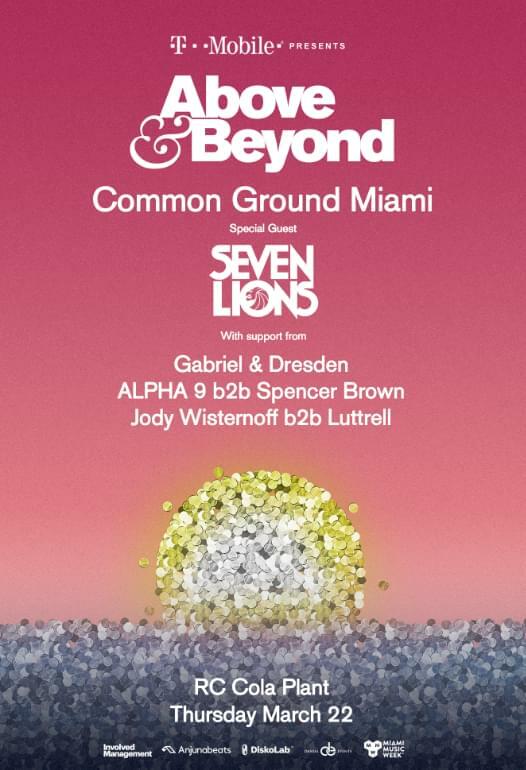 Common Ground Miami will take place on Thursday, March 22nd from 8:30pm to 4:00am and the lineup exhibits special guest, melodic dubstep producer Seven Lions. Attendees will also witness the talent of trance artists Gabriel & Dresden, and ALPHA 9 B2B Spencer Brown. Melodic techno is sure to grace the ears of guests as Jody Wisternoff and Luttrell grace the stage to perform B2B, as the party continues through the Miami night. Above & Beyond‘s masterful skills have truly brought raw emotion to the electronic dance music resumé, and if you’re looking for a night of whimsical melodies and a truly welcoming and amicable group of fans surrounding you with love and passion for these dazzling sounds, join us at Common Ground Miami. Tickets here.